TORT TALK: An Increase of Jurisdictional Limit in Pennsylvania Magisterial District Courts Coming? 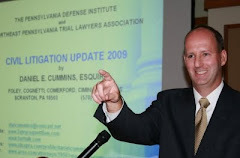 An Increase of Jurisdictional Limit in Pennsylvania Magisterial District Courts Coming? On October 5, 2010, the Pennsylvania House of Representatives passed House Bill 2172 which, in part, serves to increase the jurisdictional amount of the magisterial district courts from $8,000 to $12,000.00. It appears that the Bill was previously approved by the Pennsylvania Senate. I believe it now goes on to the Governor for the final step of his consideration of the matter. I thank Attorney and Clarks Summit, Pennsylvania Magisterial District Justice James Gibbons for bringing this to my attention.